WVO Filtering - What Is Settling? 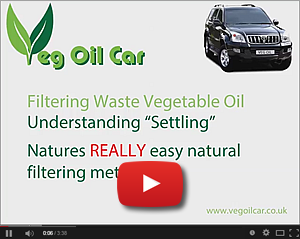 What is settling and how is it used to filter Waste Vegetable Oil? Something you'll read me constantly referring to throughout this website is settling. Settling is fundamental to most of my filtering techniques described in this site - it is amazing, simple and FREE. It's simply the application of time and gravity. I made a YouTube Video on the subject that you may find helpful. To view it, click here. As you know, Waste Veg Oil is invariably contains all manner of debris, like batter, crumbs, chips. etc, as well as fats and water. It's essential that ALL of these impurities are removed from the WVO before its used within your vehicle. Failure to do this will result in expensive motor repairs! We can does this easily through "settling" by doing NOTHING - by simply leaving the oil to stand still, agitated, for a length time. Gravity slowly and gently pulls the larger and heavier impurities within WVO towards the bottom of the container, allowing the cleaner oil to float to the top. Thus water, fats, crumbs, batter, etc, will all fall to the very bottom of the container if the oil is allowed to rest long enough. My YouTube Video on the subject may make all this a little clearer. Just because this process is simple, don't underestimate its worth. I've spent a LOT of money on fancy equipment during my filtering experiences and nothing to date has topped the results attained from settling.